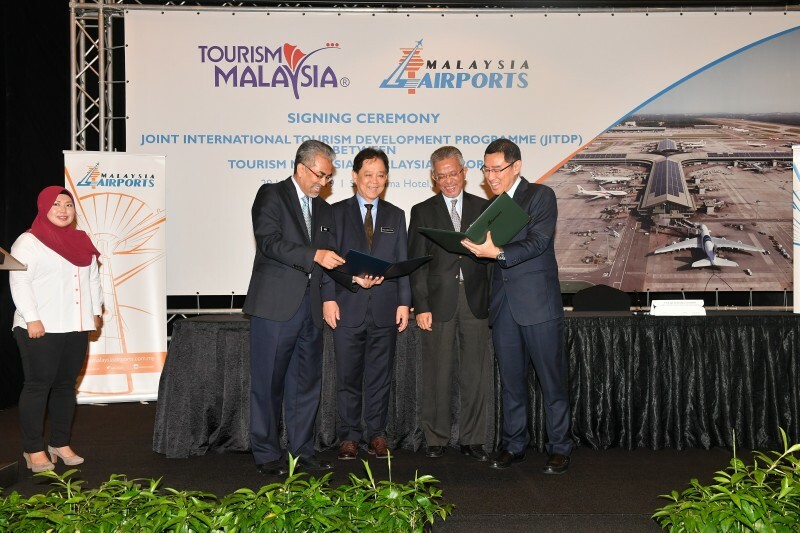 KUALA LUMPUR, 29 JANUARY 2019 – Earlier today Tourism Malaysia and Malaysia Airports signed a Memorandum of Understanding (MoU) for the Joint International Development Tourism Programme (JITDP) in a signing ceremony held at Sama-Sama Hotel, KL International Airport (KLIA). YB Datuk Mohamaddin Ketapi, the Minister of Tourism Malaysia, and YB Dato’ Kamarudin Jaffar, Deputy Minister of Transportation, witnessed the ceremony as Datuk Musa Hj Yusof, Director General of Tourism Malaysia, and YM Raja Azmi Raja Nazuddin, Group Chief Executive Officer of Malaysia Airports, represented both agencies. The MOU looks into possible cooperation between the two parties especially in the area of international tourism promotion. Among the initiatives planned are airlines collaboration, the operation of inaugural and charter flights, as well as high-yield niche tourism promotion. 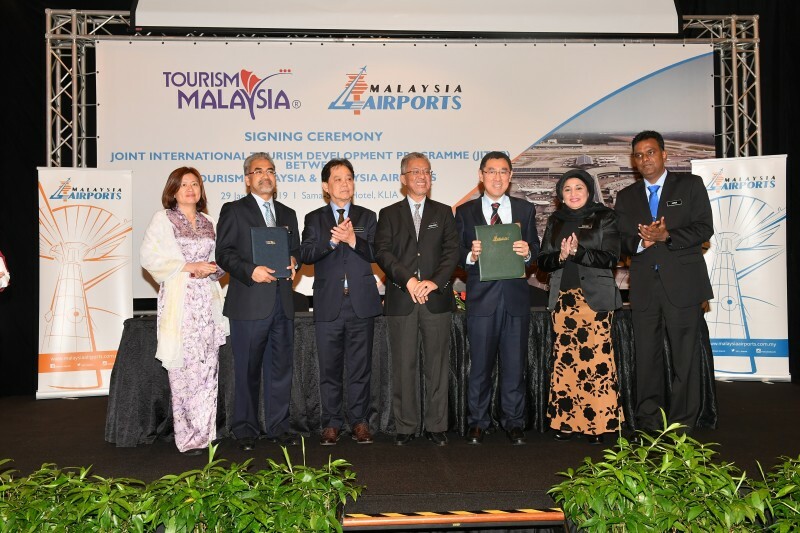 The ceremony marks a refreshed commitment between Tourism Malaysia and Malaysia Airports, having secured a similar successful programme in 2018. 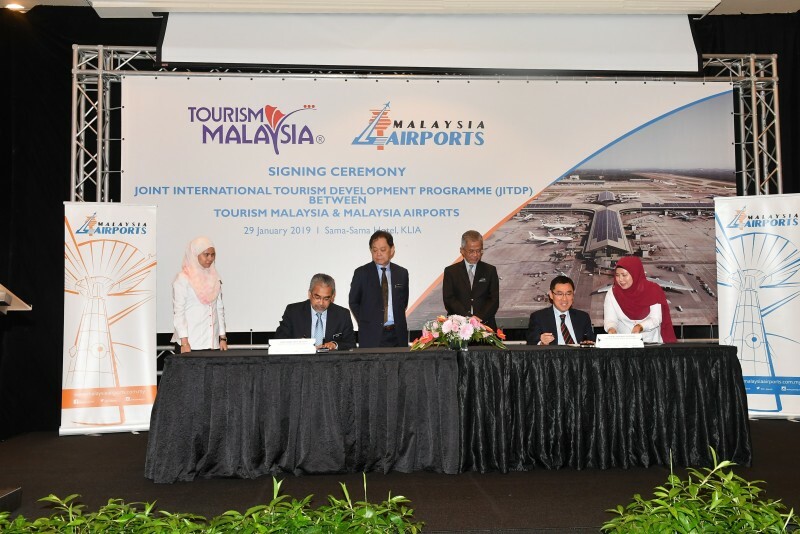 Tourism Malaysia highlighted that the initiative already succeeded in covering 20 main projects for short and long haul markets in 2018, while Malaysia Airports said that they would continue playing their role as a major airport operator in Malaysia and to enhance route development at local airports and continue strengthening Malaysia’s position as a hub. Over the past several years, Malaysia’s traffic performance was mainly driven by international sectors where international passenger traffic makes up 50% of total passenger traffic. In 2018, Malaysia Airports welcomed 11 new airlines and more than 40 new services (routes) to international destinations were added nationwide, registering a total 99 million passenger traffic movements for Malaysia operations which 51.6 million were international passengers. Both parties will contribute up to RM10 million each for this programme to be disbursed to eligible industry players for the purpose of marketing and promoting Malaysia to international audience. MALAYSIA AIRPORTS is one of the world’s largest airport operator groups in terms of number of passengers handled. It manages and operates 39 airports in Malaysia and one international airport in Istanbul, Turkey. The 39 airports in Malaysia comprise of five international airports, 16 domestic airports and 18 Short Take-Off and Landing Ports (STOLports). Its main airport, the Kuala Lumpur International Airport, which also houses klia2, the 4th best terminal serving low-cost carriers (as rated by Skytrax for year 2018) is striving towards being the preferred ASEAN hub. The two latest marketing awards won by Malaysia Airports at the prestigious Routes Asia 2018 for the “Overall” and “Over 20 Million Passengers” categories is a testimony to the organisation’s commitment in providing the best connectivity at all its airports. Over the years, Malaysia Airports and its airports have also received numerous other awards that acknowledged its commitment towards excellence in various areas such as service, engagement, corporate responsibility and governance. Malaysia Airports Holdings Berhad is listed on the Main Board of Bursa Malaysia Securities Berhad (“Bursa Malaysia”). For more information on MAHB, please visit www.malaysiaairports.com.my.